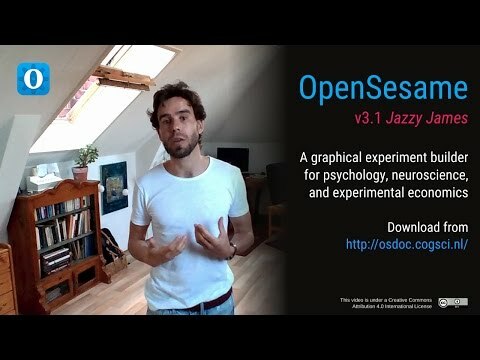 This is my first time using software like OpenSesame. I was trying to develop a 2-back task which participants have to judge and respond to item that matches the one that presented 2 items ago. I used 8 letters (B, F, K, H, M, Q, R, X) as stimuli, and I wanted each letter to appear 6 times within a list, once as a target. Before the experimental trials begin, there will be 10 trials of training with feedback. Afterwards, participants will perform four blocks 48 trials without feedback. However, when I performed a quick run of my experiment, I found it cannot give feedback properly. I used two sketchpads, one with a red cross and one with a green circle to represent incorrect and correct responses. Sometimes the feedback came before the keyboard response and sometimes when I gave the correct response it gave me an incorrect response feedback. 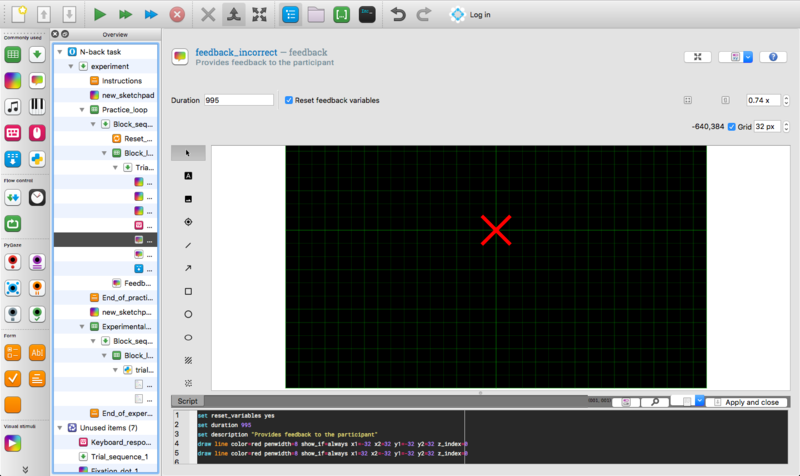 I have defined those two sketchpads to run if [correct] = 0 and [correct] = 1 but it was still not working. It was okay for me to enter the trials manually for the practice block as there was 10 trials only. However, it would be quite time consuming if I have to manually enter all four experimental blocks of 48 trials. So I would like to know is there any way that is more convenient to develop a block loop for my 2-back task? I have tried to search for Python codes for N-Back Task but I have no idea how to use them. However, when I performed a quick run of my experiment, I found it cannot give feedback properly. 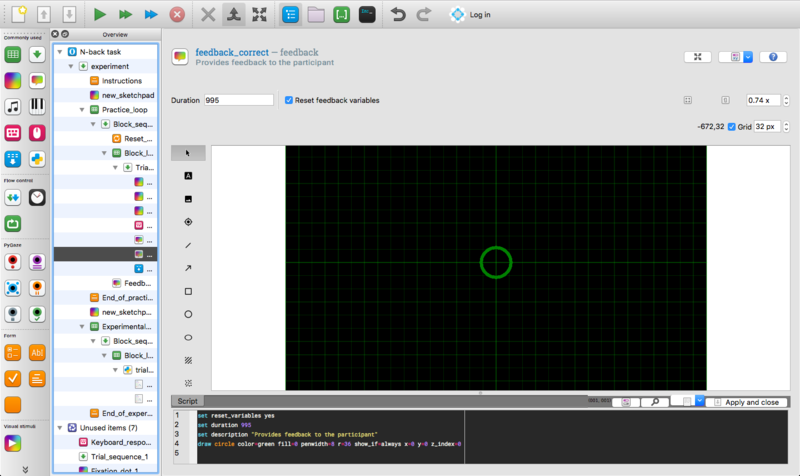 Does it work if you replace the sketchpads with feedback items (without changing the content?). See here for an explanation. So I would like to know is there any way that is more convenient to develop a block loop for my 2-back task? I recommend using an inline_script. There is probably also a way doing it with the loop table, but in my opinion, you have more control and understand better if you do it programmatically. 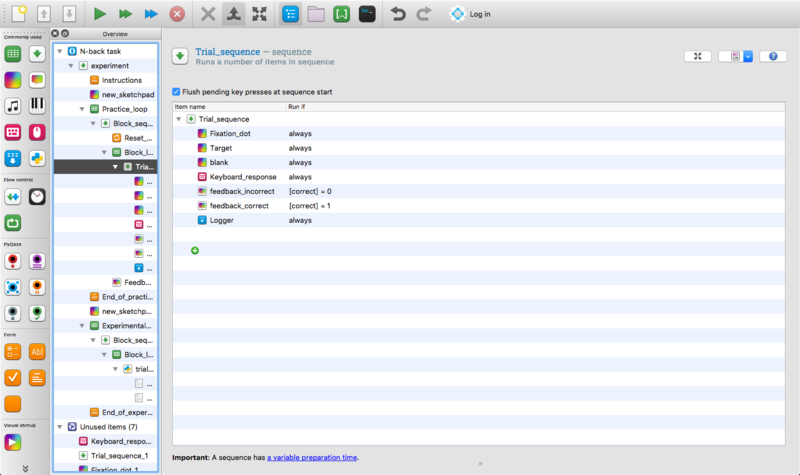 For example, you can create a random sequence of targets/nontargets for as many trials as you have. Then, assign target letters to each target position, and finally fill the rest with distractors. Please note the code is incomplete! Currently, I don't take into account the situation in which a match might overwrite a previously assigned pair. Also, you would have to fill unassigned positions with distractor letters. But I hope this code can get you started. If you need more help, let us know. This is my first time using OpenSesame and Python code so it will take me sometime to figure this out. I'm not sure this would work or not but I'm so grateful for your help. Many thanks! Are you sure? I downloaded your experiment (from the beginning) and changed it the way I suggested (slightly different than you) and it seems to work (see attachment). Once again, Thanks for your help! I think you shouldn'T be worried about the feedback yet. Once you can produce sequences that are correct, you can dive into providing proper feedback. It is a little cumbersome to fix the feedback before you actually have the sequence. There are different options. You could replace it altogether, but it would suffice if you put this inlinescript in the beginning of a block loop and all you would do in that sequence is then creating the sequence ( a list) of trials. In the trial loop you can then call one trial after another and present the stimuli the way you already doing it. If you choose this option, your loop table would largely get obsolete. Btw. One more piece of advice, before getting at the proper implementation, you should try to create the algorithm with paper & pen in pseudocode, so that you have some scaffold to orient yourself while programming. There are different options. You could replace it altogether, but it would suffice if you put this inlinescript in the beginning of a block loop and all you would do in that sequence is then creating the sequence ( a list) of trials. Try to take one step at a time. 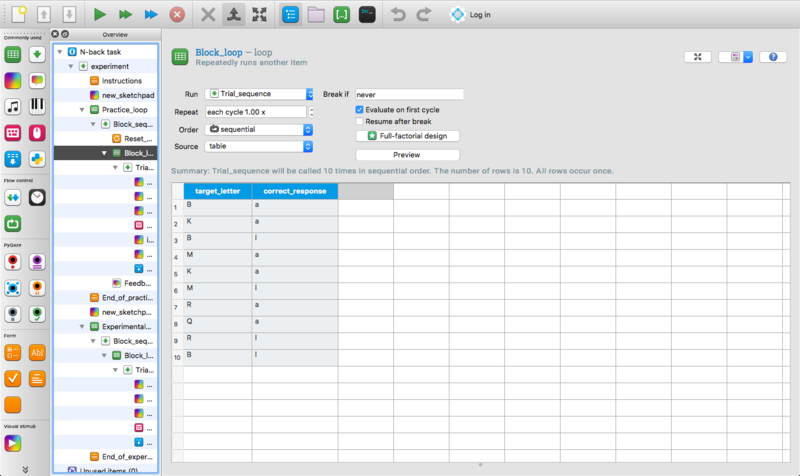 For example, never mind the n-back task for now, but just try to create a list of stimuli in the beginning of a block, and present them one by one in the trial loop on the screen. It may appear overwhelming now, but if you break it down into pieces, you will see it will be doable. And don't despair if it doesn't work out of the box. Trying to figure out what is wrong with your code is a major part of programming. Maybe you can also just follow the tutorial and try to reproduce what Sebastiaan is doing, it will give you at least a feeling of the logic to keep in mind. I will try to create the task from the beginning again. Thanks a lot for your help! 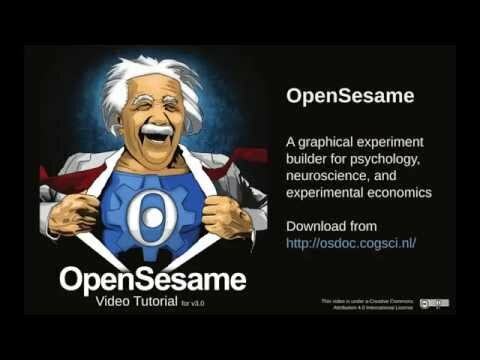 Is it ok for me to follow this tutorial if I'm running OpenSesame on Mac OS and using Expriment as the back-end of my experiment? It should be working. If you run into a problem, you can ask a specific question. There will probably be a reason for it.